New Recombinant and Sustained Release Growth Factors available now! Cell Guidance Systems has a commitment to continue working to provide our customers with the growth factors they need for their research. 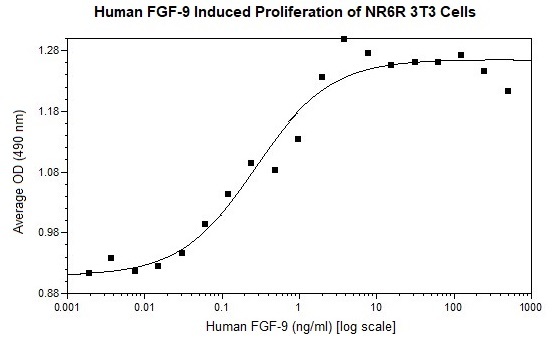 Human FGF-9 is fully biologically active when compared to standard. The activity is determined by the dose-dependent induced proliferation of NR6R 3T3 cells and it is typically less than 2 ng/ml. This corresponds to an expected specific activity higher than 5.0 x 10^5 units/mg.